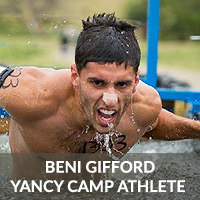 Premier OCR Athlete Beni Gifford - Yancy Camp - Fitness for Everyone! At the young age of 26, Beni Gifford has has had one of the most diverse and successful runs in the sport of OCR. In 2016 Beni and his team The Comeback Kids won the Spartan Ultimate Team Challenge on NBC, then returned in 2017 for season 2. He is a 2x competitor on the tv show Steve Austin Broken Skull Challenge on CMT where he made it to the finals in the first episode and was invited back out to compete in an all start episode, which will be airing during the winter of 2017. Beni is also one of 50 male athletes invited to compete in the inaugural Tough Mudder X competition that will air on CBS. He won his qualifier round and then finished 6th in the finals. Beni has proved to be a diverse OCR athlete with a total of 22 podium finishes at race series such as Spartan, Savage, BattleFrog, Conquer The Gauntlet, Terrain Race, Merrell Down & Dirty, Run For The Hills, and Caveman Crawl. In 2014, he finished 5th in his age group at OCR World Championships and in 2015 he was the OCR You’ll also soon be able to watch his performance on CMT’s Steve Austin Broken Skull Challenge. There may not be an OCR athlete who has had a more diverse run of podium finishes with a total of 18 at race series such as Savage Race, Spartan Race, BattleFrog, Conquer The Gauntlet, Terrain Race, Merrell Down & Dirty, Run For The Hills, and Caveman Crawl. In 2014, he finished 5th in his age group at OCR World Championships, and in 2015, he was the OCR Warrior California Tournament Champion. Beni has been on the cover of Sports Insight Magazine and when not out on course competing, he loves training with his clients, racing dirt bikes, cross country, playing soccer, mountain biking, and running mountain trails with his Siberian Husky training partner Koda.